• Click here to download a printable flyer for this year's show. 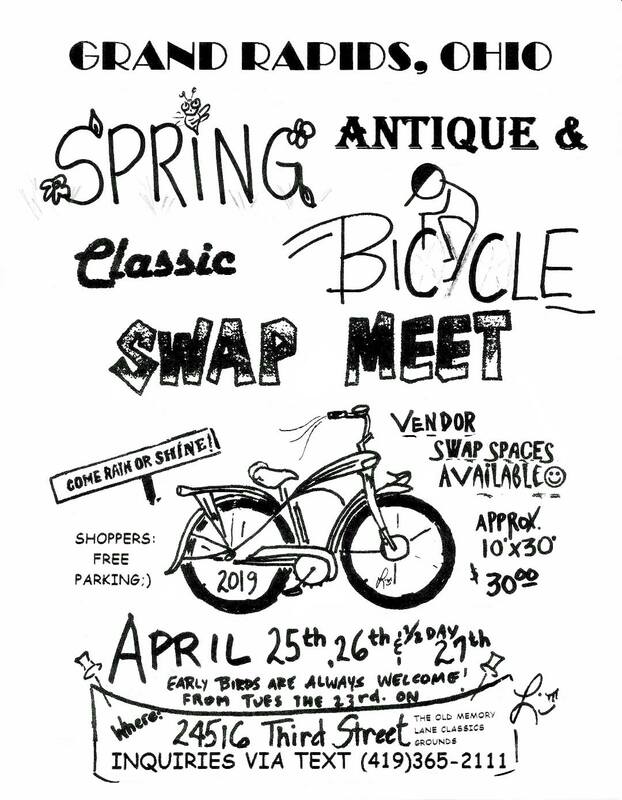 Memory Lane Spring Swap Meet, April 25th-27th. Download the flyer here. Please join us for the biggest, the oldest, the best antique and classic bicycle show in the country! April 28th, 2019 will be the 39th Anniversary of the Biggest, Oldest, and the Best Antique and Classic Bicycle Show in the Nation. This annual one day event held at the Washtenaw Farm Council Grounds, 5055 Ann Arbor/Saline Rd., Ann Arbor, Michigan 48103, will host over 250 dealers from across the continent. At last year’s show more than 10,000 Classic, Vintage and Collectible bicycles were on site representing nearly every major bicycle maker in the last century. The $5 admission (kids under 10 free) to the Show provides the public with a variety of opportunities to participate in the bicycle collecting hobby like no where else in the nation. First and foremost are the Show bikes. Typically, 50 to 75 bicycles are entered into twelve categories and the public votes for its favorites. Awards are presented to the first place winners in such categories as Best Unrestored, Best Lady’s, Best Motorized Bike, Best Early Classic, Best Custom Classic and the Best Bike of each decade 1930 through 1970. Next is the “Classic Bike of the Year Award”. This is a judged event, which focuses on some of the finest, rarest and most sought after bicycles in the bicycle collecting hobby. All of these bicycles are from private collections and are seldom seen outside of museums or auctions. The winner will be crowned “Classic Bike of the Year 2019”. The Show features a Classic Bike Corral located in Bldg. E. Anyone who thinks they may have a valuable or collectible bike can put it in the Corral for only $10 and let the crowd decide it’s value. If no one meets the owner’s asking price the bike goes back to the owner and they’ll get $5 back. The result is an appraisal from the crowd for only $5. Besides all the buying and selling of bicycles there is the giving away of door prizes. The $5 cost to get into the Show includes a free door prize ticket. Prizes will be given away each ½ hour. This year, a minimum of 4 new collector bikes (not yet determined) will be given away to some lucky winners. You need to be present to win and you can only get a chance by coming to the show. This is a great event for the entire family. The bicycle displays will surely bring back many interesting memories to all the grown-ups whether it’s their first bike, their paper route bike, or even the bike that you got for Christmas. It may even provide an opportunity to fulfill a dream and finally get the bike you always wanted. Once one learns how to ride a bike, one never forgets that first feeling of freedom and excitement. Here’s a great chance to see what this great hobby is all about, take some pictures of the bike you had as a kid and share a great family day together having a unique experience that only happens once a year. This event is mostly indoors, so rain or shine the show is on. • In 2018, 100 bikes were entered in the regular bike show, competing for twelve class awards. See your favorites, plus many more. • Classic Bicycle Corral in Bldg E ($10 PER BIKE, $5 BACK IF IT DOESN'T SELL). • $800 in cash awards for Bike of the Year! • Show bikes include everything from 1800's high wheelers to Classic Balloon tire bicycles to 1960s-70s bmx bikes and vintage racers. • Pre-registration required for vendors. • $5.00 Admission. Kids 10 and under FREE. • Door prizes and free parking. • Vendor Set-up: Saturday 1pm - 7pm ($20 fee). Sunday 6:45 am - 8 am. • Gates open at 8 am to the public. • Show until 3:00 pm.